Happy Saturday everyone, and thanks so much for stopping by! Saturday means it's time for a new challenge at Allsorts as well as a new linky party here on my blog. At Allsorts Helene wants us to use Handmade Flowers on our creations, and as always, for the Papercrafters' Linky Party, the theme is simply Anything Papercrafts, and you can find the linky at the end of this post where I have also posted last week's top choice. For my card today I decided to use the die set Pinwheel by Penny Black along with some stamps by Stampin Up (Butterfly Basics, Canvas background stamp, French Script background stamp) and the sentiment is from the set Sprinkles and Smiles by Penny Black . I used some washi tape to mask off the edges before inking with Ranger Tim Holtz Distress Ink Pads Mowed Lawn and Broken China. Before stamping the leaf and floral stamp by Stampin Up I removed the washi tape. The flowers were die cut using my Sizzix Big Shot machine, folded them in half and stuck a dimentional glue dot in between to keep the top petals down, then I used some Seedless Preserves Distress ink for inking the blooms. A 1/2 inch circle punch and black card stock was used for the flower center which I attached with a glue dot. Card stock is by Neenah. This week at Allsorts challenge we are sponsored by StickerYou who are offering a $65 gift certificate to the lucky winner. I hope you'll come play along with us for a chance to win! Disclaimer: This post contains affiliate links. I might earn a small commission if you purchase from the links, at no additional cost to you. 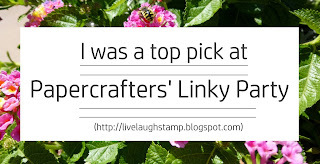 Welcome to Papercrafters' Linky Party 3 where Anything Papercrafts Goes! Congratulations!! Feel free to place the top pick logo to your own blog if you like. 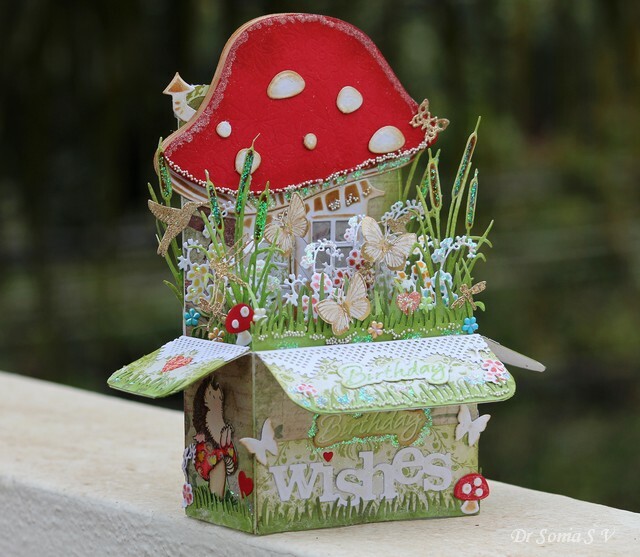 Sonja made this stunning pop up box card. So many great details here, and so much creativity! I always admire these types of cards. I have tried creating one once, but sadly I gave up. I might have to give it another try after seeing Sonja's beautiful creation! Thank you for your inspiration Sonja! Now it's time for the new linky party.To share your papercraft simply use the linky tool below. You have until midnight Friday the 23rd to link up. A new top pick will then be featured here next Saturday. I can't wait to see what you're all up to in the craft room or studio. Great deals daily! Click to see what's today's deal! Such a pretty and imaginative way to create your flowers Ellie, so pretty as well. Sooooooooo gorgeous! LOVING those colors!!! And CONGRATS to Sonia!!!!!!!! WOW Thank you so much !! What an honor!! Ellie your talent never ceases to amaze me! I love this card. The background you created is stunning and I love those flowers! Your first card is gorgeous, I love the CAS, but colourful, design! Thanks for joining us at Country View Challenges this month. Stunning flowers Ellie, I love them and the gorgeous colour, super background too. Really pretty flowers - the color is just amazing and I really love all the details on your creation! So happy you could share this with us at Happy Little Stampers Anything Goes w/ Dies Challenge and good luck! Eine wunderschöne Karte, liebe Ellie! Beautiful. Thanks for joining us at Pause Dream Enjoy Challenges. Such a fun and sweet spring card! Love the way you created the petals. This is absolutely stunning. I love it. Great work. Thank you for sharing with us over here at "A Perfect Time To Craft" and best of luck with your entry. What a beautiful card!!! Your background is amazing!!! I love your chosen colours!!! Thank you for joining the February challenge of the Country View Challenges! Hi Ellie, what a wonderful birthday card, the background combined with the flowers in front is perfectly made! Beautiful card! Great background with the flowers popping up. Thanks for joining us at Happy Little Stampers Anything Goes with Dies! Beautiful card - very elegant flowers. Beautiful card, love the flowers and background! Thank you for sharing with us over at The Creative Crafters! Hope to see you again!